Two 5th graders have appeared at your classroom door. “May we schedule a survey in your class, please?” Of course you want to know what this is about so you ask. The students explain that they are reading about hydrogenated oils in the foods we buy in the grocery store. They read a recent Time For Kids article in class, and it inspired them to do further research. The students are assessing opinions to see if they have enough support to ask legislators to add information about hydrogenated oils to food labels. First, they want to share what they learned about the issue with your students. Then, they want to survey each class so they have statistics to share in the letter they’re writing. Hands shoot up and almost everyone wants to know more. You are impressed with the researchers’ knowledge, their passion for the subject and their ability to articulate the facts to your students. You look at the clock. Thirty minutes just flew by. You realize the girls completed their pitch. You’re as interested as they are. “Go ahead and do your survey right now,” you suggest. You think back to when you were in school: lists of assignments on the board, students dutifully copying them down, reading chapters of the text, teachers screaming when the work wasn’t done. Your seventh grade teacher slapped the desks hard with a yardstick and then lectured on the value of doing schoolwork. “OK. Pop quiz time,” she’d announce as if that would make the kids who didn’t care start to care. “Times have changed,” you think to yourself. You smile as you watch the animated little teachers in full swing. Such is the life of a classroom engaged in inquiry projects. Intermediate students love a good fight. Capitalize on this characteristic and you just might harness their energy and save the planet. Worried about Common Core? Turn students loose to investigate what they care about and they will learn all the standards - and they will be leading the way. They will know the content objectives, too. 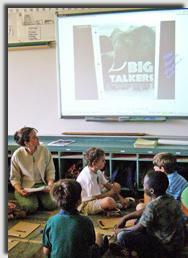 In an inquiry classroom, students read – volumes! They also explore a topic thoroughly, validate a series of sources and become mini-experts. Could these girls do what they did without reading? Picture the room. It is full of books and articles – first- and second-hand sources - of all kinds that you and your students bring in. Reading nonfiction is a regular part of the day. Through investigating, students learn and remember vocabulary in context. They even keep vocabulary notebooks. Challenging texts? Heck, yeah. Learning to read with a dictionary beside them is normal for these students, because they are invested and they want to know. Students will ask questions, too - about how to read better. Reading is the pathway to the end result. They have to know and you will be there to answer their questions. You will model decoding, comprehension and fluency skills and whatever else students require. You will know what to teach because they will tell you what they need. Students will know first-hand about resources, too. They will discover the differences among and usefulness of almanacs, encyclopedias and the Internet. You won’t have to tell them and they won’t tune you out. You are the expert at finding information. You will find the resources so they can put their hands on them and find or not find what they need. They will come to you when they need to know. Reading instruction will be covered, hands down. Students who investigate know writing from both sides of the fence: as readers and authors. As a result of studying mentor texts, students play with what works. They learn how to embed quotes, for example, by analyzing what authors selected to include in nonfiction writing and how they put the quotes in the writing. Your readers and writers will know text structures because they will deconstruct how authors put the text together. How does the article begin? How does the author finish? As a result, your writers will imitate similar texts on their own. With you as their guide, your students will learn how to write persuasively. They will even use the power of narrative stories scattered throughout to soften their readers’ hearts. Knowing an author’s purpose will be a no-brainer, because the students are authors and they know just what they want to accomplish. Spelling and grammar matter too, because the writing will be published. Investigators cannot be shy. Like the students who came to explain their Time For Kids project, investigators learn how to speak publicly. Your students will work together to get the job done, especially as the deadline draws near. They will search for articles to share with one another because they will come across them in their research and redirect them to the right people. They will pitch in and help one another on several projects at one time in order to meet deadlines. Readers will plan their day and write to you about what they accomplished. And you? You are their coach, showing them how to get the job done in a way that will be heard. Students will be working with you, not against you, because you’re all going in the same direction. Gone will be the days of begging them for homework or class work. The consequence will be standing in front of an audience, a video camera, or the even principal with nothing to say. Over time, even the most stubborn child learns he wants to say something, too. How do I know? Because my intermediate students were steeped in inquiry projects in my classroom. They once wrote an 8-chapter novel and produced several movies. Everything I tell you in this article has happened in my classrooms. Students were engaged at the highest, possible levels - unlike anything I dreamed possible back in college. And the girls who came to my room? The article my colleague’s students wrote was published in Time For Kids. The company made a video about their project and showed it at their convention. What about end-of-year tests, you might ask? By the end of these studies, students are prepared. Tests are easy when students explore the world deeply. These projects are the most difficult puzzles and require thinking, planning, organizing, collaborating and revising. Besides, our tests are literacy tests. They measure whether children can read and write. When children read and write on a daily basis about what they care about, they will remember how on test day. The students who wrote the novel and the students who wrote the article for Time For Kids scored the highest in the school. How could it have turned out any other way?